Using integrated shutter button, interchangeable lenses and grips, SNAP!7 iPhone 7 case bring your phonegraphy to a new level, and durable design protects your iPhone 7/7 Plus in daily life. The SNAP!7 is a versatile snap-on protective case that focuses on delivering more awesome photos and videos using your iPhone 7 or iPhone 7 Plus. As we can see from the images, similar with SNAP! Pro iPhone 6s case, the iPhone case sports a slim and elegant appearance, and its low-profile matte finish provides a comfortable and firm grip experience. To replicate the feeling when holding a digital camera for shoots, the SNAP!7 iPhone 7 case features an integrated physical shutter button, a removable thumb rest and two interchangeable ergonomic grips, so you can quickly and comfortably capture every wonderful moment with your handset just like raising a compact camera. 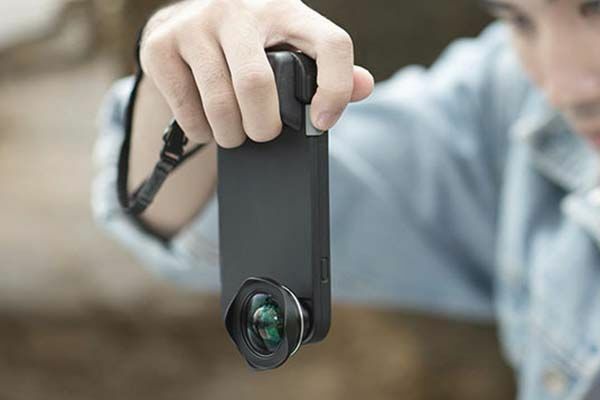 Furthermore, the iPhone case also features 7 optional interchangeable phone lenses including wide-angle/macro, CPL, full-frame fisheye, ultra wide-angle, fisheye, 3X telephoto and HD wide-angle. All the phone lenses can be easily attached to the case using its integrated adapter, which can bring more creativities and ideas to your photos and videos. Moreover, its tripod hole allows you to attach your phone onto any camera tripod for selfies, groups shots, time-lapse, night views and landscape. In addition, using its dual-material design, the iPhone 7 case protects your handset from shocks and scratches, and all iPhone buttons and functions are accessible with ease.